About the writer Mary Pickels is a Tribune-review staff writer and can be reached at 724-836-5401 or via e-mail. Very clear evidence that I hadn't seen before. Worth a look. A-10 Warthog Made the Shanksville Crater? A-10 Warthog/Thunderbolt was flying very low over the crash site at exactly the moment the explosion, fireball occurred. 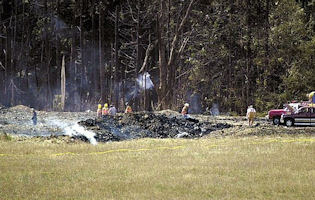 Susan Mcelwain - who lives two miles from the site, knows what she saw - the white plane rocketed directly over her head. "It came right over me, I reckon just 40 or 50ft above my mini-van," she recalled. "It was so low I ducked instinctively. It was traveling real fast, but hardly made any sound. "Then it disappeared behind some trees. A few seconds later I heard this great explosion and saw this fireball rise up over the trees, so I figured the jet had crashed. The ground really shook. So I dialed 911 and told them what happened. "I'd heard nothing about the other attacks and it was only when I got home and saw the TV that I realized it wasn't the white jet, but Flight 93. I didn't think much more about it until the authorities started to say there had been no other plane. The plane I saw was heading right to the point where Flight 93 crashed and must have been there at the very moment it came down.